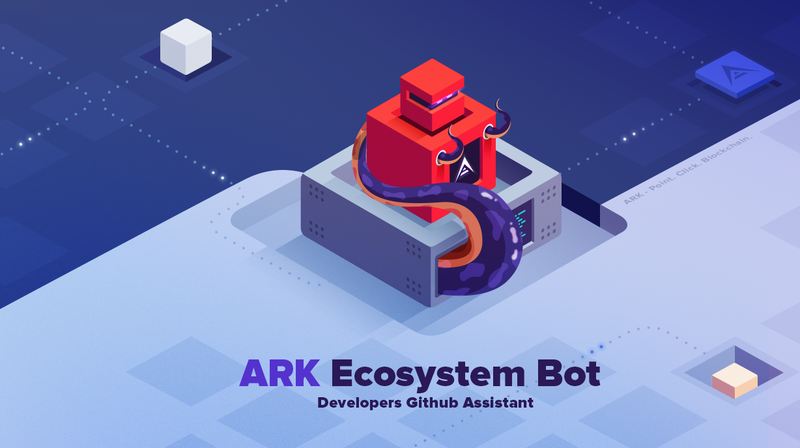 With the new ARK Developers Bounty Program it is time to release the ARK Ecosystem Bot! This custom bot was designed to help newcomers and our developers rank Pull Requests, assign proper labels, let developers know what’s still missing and other functions. The ARK Ecosystem Bot will have a few tasks to aid our developers and wider audiences when interacting on GitHub. Let’s go over some of these features. 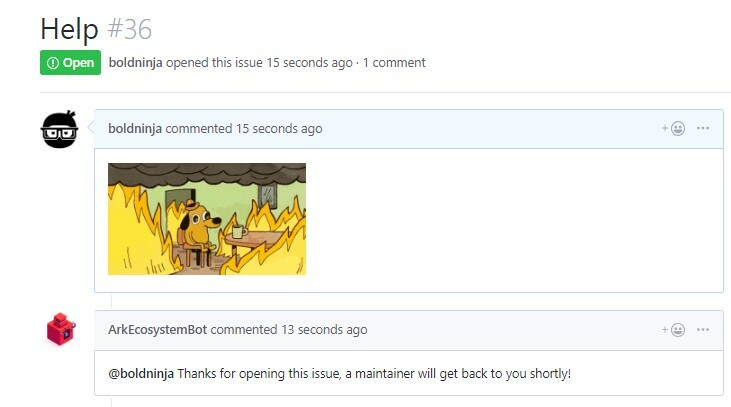 Opening an issue — when you open an issue the bot will let you know that one of our maintainers will get back to you shortly. Opening a pull-request — when you open a pull request it confirms a successful submission and that one of the maintainers will review it shortly. “Nudging” ARK developers — when someone opens a PR it will ping our maintainers to inform them there is a new PR to review. It will send a reminder in one week if there is no response. 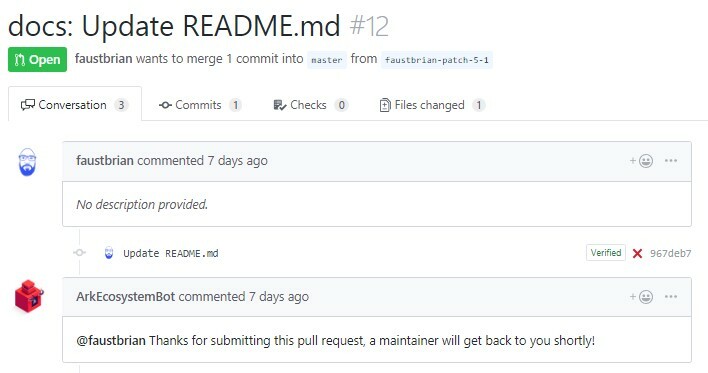 Analyzing pull requests — depending on the title and content it will auto-assign labels to the PR, including the type, the complexity and that a review is needed. Circle-CI job information — every pull request needs to go through an automated testing phase. If testing fails it will ping the PR submitter for correction and link it to the Circle-CI job to review. Changes needed — if changes are detected by one of our maintainers (correcting code, typos) it will ping the PR submitter for correction before merging can take place. Bounty amount — once merged it will let you know bounty tier you qualify for and your award total for the end of the month. The Bot also tracks bounties, number of merged pull requests and amounts. It will also notify our developers if a pull request wasn’t assigned a bounty when merged so nothing is missed. A new leader board for the new website will be prepared with all of the contributors listed, allowing everyone to see monthly contributions and awards that can be expected each month. One of the helpful new features of the bot is the ability to prepare statistics for each of our repositories. This will allow everyone to easily see how active our developers and community are. 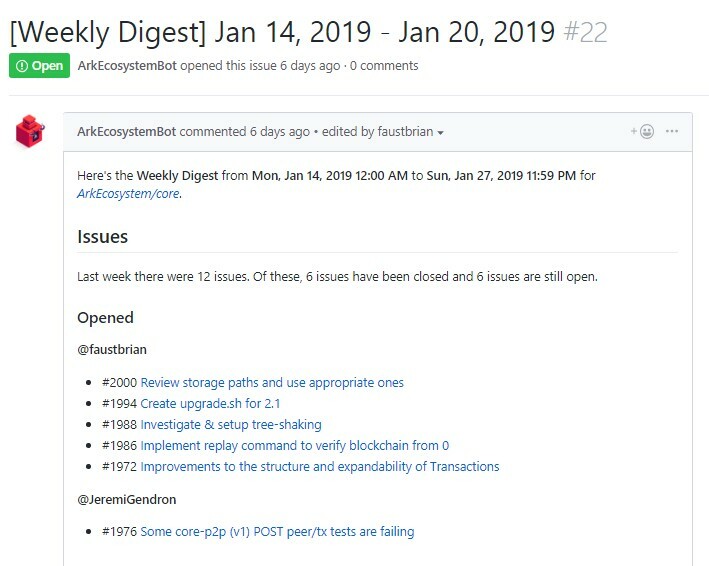 Each week there will be a ‘Weekly Digest’ that will open as an issue (automatically) by the bot and accumulate information gained over the week (opened issues, closed issues, merged pull requests, new star gazers, …). This allows those who are not so familiar with GitHub to gather information on a single page that is easily readable and also lets developers quickly glance to see if anything needs attention. The Bot will also prepare an overall view of our monthly statistics that will be converted to a blog post and posted here. This will allow a birds eye view for everyone who doesn't follow our GitHub but would still like to see the numbers and track the activity of our developers. Like the Weekly Digest, this will also be presented in an easy to understand format. So, from now on, you can expect a monthly blog post covering development statistics from our team and community developers. Additional features will be added to the bot over time, both by the ARK team and from community input. If you have any ideas for expanding the feature set of the bot, please don’t hesitate to let us know.